Utah will live with the disappointment of a game that got away, as Northwestern rallied. (Trent Nelson | The Salt Lake Tribune) The University of Utah warms up before facing Northwestern in the Holiday Bowl, NCAA football in San Diego, Calif., on Monday Dec. 31, 2018. (Trent Nelson | The Salt Lake Tribune) The University of Utah prepares to face Northwestern in the Holiday Bowl, NCAA football in San Diego, Calif., on Monday Dec. 31, 2018. Utah Utes running back TJ Green (4) at center (Trent Nelson | The Salt Lake Tribune) Utah Utes wide receiver Jaylen Dixon (25) celebrates a first quarter touchdown as the University of Utah faces Northwestern in the Holiday Bowl, NCAA football in San Diego, Calif., on Monday Dec. 31, 2018. At right is Utah Utes quarterback Jason Shelley (15) (Trent Nelson | The Salt Lake Tribune) Utah Utes wide receiver Jaylen Dixon (25) celebrates a first quarter touchdown as the University of Utah faces Northwestern in the Holiday Bowl, NCAA football in San Diego, Calif., on Monday Dec. 31, 2018. (Trent Nelson | The Salt Lake Tribune) Utah Utes linebacker Francis Bernard (36) knocks the ball away from Northwestern Wildcats running back John Moten IV (20) as the University of Utah faces Northwestern in the Holiday Bowl, NCAA football in San Diego, Calif., on Monday Dec. 31, 2018. (Trent Nelson | The Salt Lake Tribune) Utah Utes quarterback Jason Shelley (15) runs the ball as the University of Utah faces Northwestern in the Holiday Bowl, NCAA football in San Diego, Calif., on Monday Dec. 31, 2018. (Trent Nelson | The Salt Lake Tribune) The University of Utah faces Northwestern in the Holiday Bowl, NCAA football in San Diego, Calif., on Monday Dec. 31, 2018. (Trent Nelson | The Salt Lake Tribune) Utah Utes tight end Jake Jackson (44) scores a touchdown as the University of Utah faces Northwestern in the Holiday Bowl, NCAA football in San Diego, Calif., on Monday Dec. 31, 2018. (Trent Nelson | The Salt Lake Tribune) Utah Utes linebacker Cody Barton (30) and Utah Utes defensive back Javelin K. Guidry (28) sack Northwestern Wildcats quarterback Clayton Thorson (18) as the University of Utah faces Northwestern in the Holiday Bowl, NCAA football in San Diego, Calif., on Monday Dec. 31, 2018. (Trent Nelson | The Salt Lake Tribune) Utah Utes defensive tackle John Penisini (52) stops Northwestern Wildcats running back Isaiah Bowser (25) on a fourth down play as the University of Utah faces Northwestern in the Holiday Bowl, NCAA football in San Diego, Calif., on Monday Dec. 31, 2018. (Trent Nelson | The Salt Lake Tribune) Utah Utes tight end Jake Jackson (44) scores a touchdown as the University of Utah faces Northwestern in the Holiday Bowl, NCAA football in San Diego, Calif., on Monday Dec. 31, 2018. (Trent Nelson | The Salt Lake Tribune) Utah Utes defensive tackle John Penisini (52) stops Northwestern Wildcats running back Isaiah Bowser (25) on a fourth down play as the University of Utah faces Northwestern in the Holiday Bowl, NCAA football in San Diego, Calif., on Monday Dec. 31, 2018. (Trent Nelson | The Salt Lake Tribune) Northwestern Wildcats defensive back Alonzo Mayo (10) tackles Utah Utes running back TJ Green (4) as the University of Utah faces Northwestern in the Holiday Bowl, NCAA football in San Diego, Calif., on Monday Dec. 31, 2018. (Trent Nelson | The Salt Lake Tribune) Utah Utes quarterback Jason Shelley (15) looks to pass as the University of Utah faces Northwestern in the Holiday Bowl, NCAA football in San Diego, Calif., on Monday Dec. 31, 2018. (Trent Nelson | The Salt Lake Tribune) Utah Utes place kicker Matt Gay (97) scores a field goal as the University of Utah faces Northwestern in the Holiday Bowl, NCAA football in San Diego, Calif., on Monday Dec. 31, 2018. (Trent Nelson | The Salt Lake Tribune) Utah Utes defensive back Marquise Blair (13) intercepts a bobbled pass intended for Northwestern Wildcats wide receiver Berkeley Holman (16) as the University of Utah faces Northwestern in the Holiday Bowl, NCAA football in San Diego, Calif., on Monday Dec. 31, 2018. (Trent Nelson | The Salt Lake Tribune) Utah Utes quarterback Jason Shelley (15) stiff-arms Northwestern Wildcats defensive back JR Pace (13) as the University of Utah faces Northwestern in the Holiday Bowl, NCAA football in San Diego, Calif., on Monday Dec. 31, 2018. (Trent Nelson | The Salt Lake Tribune) Utah Utes linebacker Cody Barton (30) gets in on a sack of Northwestern Wildcats quarterback Clayton Thorson (18) as the University of Utah faces Northwestern in the Holiday Bowl, NCAA football in San Diego, Calif., on Monday Dec. 31, 2018. (Trent Nelson | The Salt Lake Tribune) Utah Utes defensive tackle Pita Tonga (49) pressures Northwestern Wildcats quarterback Clayton Thorson (18) as the University of Utah faces Northwestern in the Holiday Bowl, NCAA football in San Diego, Calif., on Monday Dec. 31, 2018. (Trent Nelson | The Salt Lake Tribune) Utah Utes head coach Kyle Whittingham as the University of Utah faces Northwestern in the Holiday Bowl, NCAA football in San Diego, Calif., on Monday Dec. 31, 2018. (Trent Nelson | The Salt Lake Tribune) Utah Utes quarterback Jason Shelley (15) walks off the field after a turnover as Northwestern players celebrate in the background. 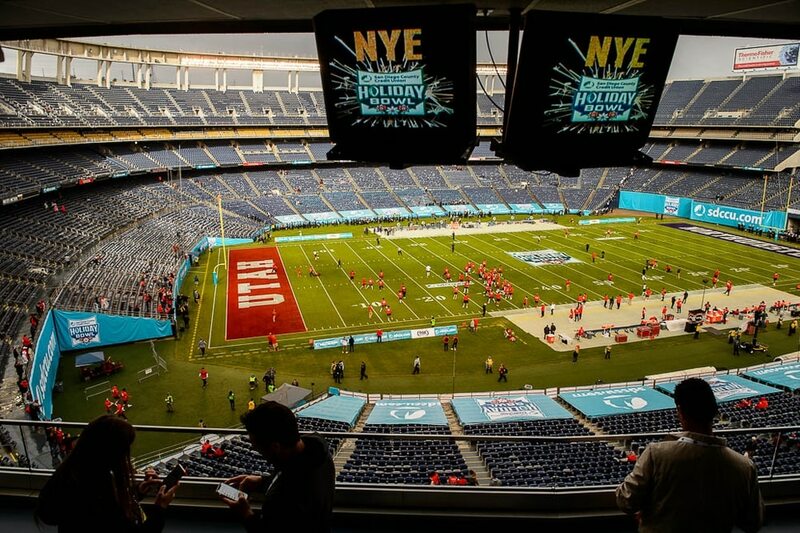 The University of Utah faces Northwestern in the Holiday Bowl, NCAA football in San Diego, Calif., on Monday Dec. 31, 2018. (Trent Nelson | The Salt Lake Tribune) Utah Utes quarterback Jason Shelley (15) on the sideline after a turnover as the University of Utah faces Northwestern in the Holiday Bowl, NCAA football in San Diego, Calif., on Monday Dec. 31, 2018. (Trent Nelson | The Salt Lake Tribune) Utah Utes wide receiver Jaylen Dixon (25) loses control of the ball as the University of Utah faces Northwestern in the Holiday Bowl, NCAA football in San Diego, Calif., on Monday Dec. 31, 2018. (Trent Nelson | The Salt Lake Tribune) Northwestern Wildcats wide receiver Cameron Green (84) loses the ball after a hit by Utah Utes defensive back Corrion Ballard (15) as the University of Utah faces Northwestern in the Holiday Bowl, NCAA football in San Diego, Calif., on Monday Dec. 31, 2018. (Trent Nelson | The Salt Lake Tribune) Utah Utes wide receiver Siaosi Mariner (8) on the sideline after a turnover as the University of Utah faces Northwestern in the Holiday Bowl, NCAA football in San Diego, Calif., on Monday Dec. 31, 2018. (Trent Nelson | The Salt Lake Tribune) Utah Utes quarterback Jason Shelley (15) walks off the field after a turnover as the University of Utah faces Northwestern in the Holiday Bowl, NCAA football in San Diego, Calif., on Monday Dec. 31, 2018. (Trent Nelson | The Salt Lake Tribune) Utah Utes wide receiver Bryan Thompson (19) pulls in a catch as the University of Utah faces Northwestern in the Holiday Bowl, NCAA football in San Diego, Calif., on Monday Dec. 31, 2018. (Trent Nelson | The Salt Lake Tribune) Utah Utes wide receiver Jaylen Dixon (25) on the sideline after a turnover as the University of Utah faces Northwestern in the Holiday Bowl, NCAA football in San Diego, Calif., on Monday Dec. 31, 2018. (Trent Nelson | The Salt Lake Tribune) Utah Utes head coach Kyle Whittingham looks to the scoreboard late in the fourth quarter as the University of Utah faces Northwestern in the Holiday Bowl, NCAA football in San Diego, Calif., on Monday Dec. 31, 2018. (Trent Nelson | The Salt Lake Tribune) Utah players walk off the field as the University of Utah loses to Northwestern in the Holiday Bowl, NCAA football in San Diego, Calif., on Monday Dec. 31, 2018. (Trent Nelson | The Salt Lake Tribune) Northwestern Wildcats defensive lineman Joe Gaziano (97) strips the ball from Utah Utes quarterback Jason Shelley (15) as the University of Utah faces Northwestern in the Holiday Bowl, NCAA football in San Diego, Calif., on Monday Dec. 31, 2018. (Trent Nelson | The Salt Lake Tribune) Utah Utes quarterback Jason Shelley (15) as the University of Utah faces Northwestern in the Holiday Bowl, NCAA football in San Diego, Calif., on Monday Dec. 31, 2018. (Trent Nelson | The Salt Lake Tribune) Utah fans stand in the rain late in the game as the University of Utah faces Northwestern in the Holiday Bowl, NCAA football in San Diego, Calif., on Monday Dec. 31, 2018. (Trent Nelson | The Salt Lake Tribune) Utah Utes head coach Kyle Whittingham walks off the field, shaking his head, as the University of Utah loses to Northwestern in the Holiday Bowl, NCAA football in San Diego, Calif., on Monday Dec. 31, 2018. (Trent Nelson | The Salt Lake Tribune) Utah Utes wide receiver Jaylen Dixon (25) on the sideline after a turnover as the University of Utah faces Northwestern in the Holiday Bowl, NCAA football in San Diego, Calif., on Monday Dec. 31, 2018. (Trent Nelson | The Salt Lake Tribune) Utah Utes wide receiver Jaylen Dixon (25) loses control of the ball, defended by Northwestern Wildcats defensive back Trae Williams (3) as the University of Utah faces Northwestern in the Holiday Bowl, NCAA football in San Diego, Calif., on Monday Dec. 31, 2018. San Diego • Kyle Whittingham’s 25th season as a member of Utah’s football staff ended Monday night, when he witnessed a turnaround unlike anything in his coaching career. Four Utah turnovers. Four Northwestern touchdowns. 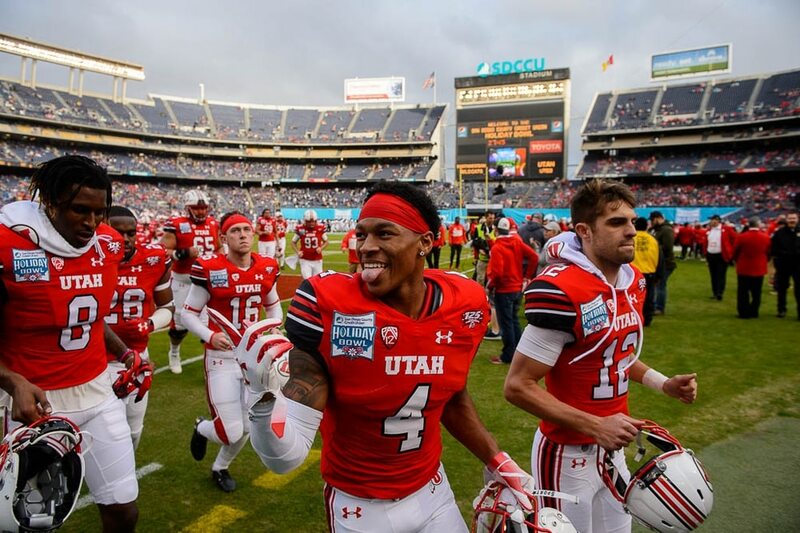 Just like that, the story went from Utah’s history of thriving in bowl games to having everybody wonder what just happened in the 41st Holiday Bowl. Northwestern went from trailing by 17 points at halftime to winning by 11 after three quarters of a 31-20 victory at SDCCU Stadium. “I've been coaching a long time, and I don't think I've ever been part of a quarter like that third quarter,” Whittingham said. The fourth quarter of Utah's 35-27 win over BYU in November comes close. 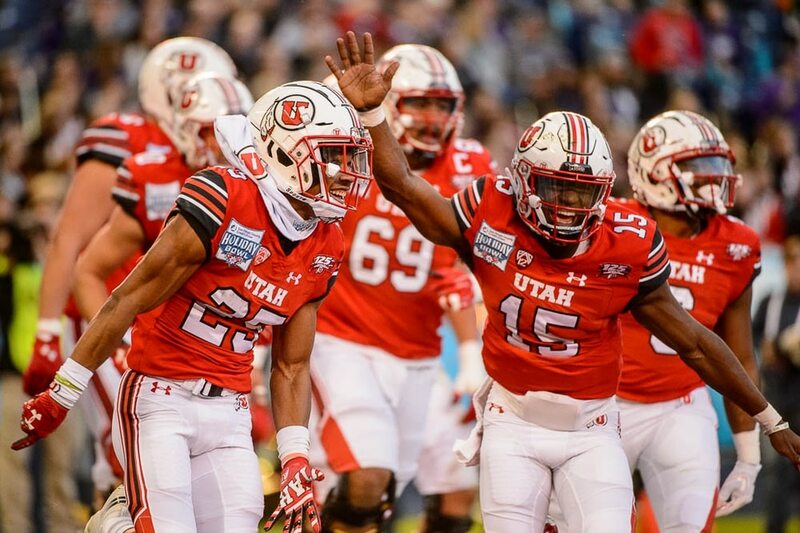 The Utes staged their own 28-0 closing run that night, although that rally from 20 points behind started late in the third quarter and didn't include any takeaways. In this episode, Utah’s turnovers resulted in one defensive touchdown for Northwestern and demoralized its own defense. “We kind of smile in the face of adversity,” Ute linebacker Cody Barton said, but the offense’s two interceptions and two fumbles in the third quarter caused too much emotional damage. So the Utes (9-5) now have lost a bowl game in the program’s Pac-12 era, having made six trips in eight seasons. They’ll also live with two losses to end a year for the first time since 1996, thanks to Washington’s win in the Pac-12 championship game. Whittingham’s bowl record is 11-2. That was difficult to remember, amid Monday’s madness. • Utah’s veteran offensive line will need three replacements in 2019, and will require some improvement in run blocking against top-tier opponents. In losses to Washington and Northwestern, Utah averaged only 71 rushing yards. The Utes posted 91 yards Monday, thanks mostly to quarterback Jason Shelley. A stronger running game would have enabled Utah to finish drives and kept outgoing offensive coordinator Troy Taylor from calling a run-pass option from the 6-yard line on the play that resulted in Northwestern’s touchdown via Shelley’s fumble. “I'm a firm believer you don't have to run for 300 yards a game, but you've got to run it efficiently,” Whittingham said. The return of injured running back Zack Moss, a 2019 NFL draft prospect as a junior, certainly would help. • In a weird way, Jason Shelley’s performance may have solved a dilemma. For all of the good things Shelley did in three November wins and in Monday’s first half, Tyler Huntley is Utah’s best quarterback. Huntley couldn't play against Northwestern, eight weeks after breaking his collarbone, but he'll be healthy for spring practice in March and likely will be the starter as a senior. Even so, Shelley is a proven player, having passed for 302 yards in a bowl game. His turn will come again as a junior in 2020. • The Utes could have gone to the Rose Bowl. They also could have finished 8-6, with three straight losses. Utah’s strong finish against BYU became more important after the missed opportunities against Washington and Northwestern. Imagine what this offseason would be like otherwise. Clayton Thorson. Northwestern's quarterback completed 21 of 30 passes for 241 yards and two touchdowns with one interception, becoming the school's career passing yards leader in his 53rd start. With the Utes seemingly about to restore their lead to 27-10 midway through the third quarter, Northwestern's Joe Gaziano stripped the ball from Shelley. Jared McGee picked it up and ran 86 yards to the end zone. Just like that, it was 20-17. The Utes still led, but it suddenly felt like they were behind. Runner-up: Shelley’s 27-yard touchdown pass to Jaylen Dixon for Utah’s first score. That threaded pass was one of nine connections for the high school teammates, but they also were involved in all six of Utah turnovers. The Utah-BYU game in Provo is less than eight months away. It’s Rivalry Week, for 35 weeks. Other checkpoints exist, though. Utah has two staff vacancies, needing an offensive coordinator and a defensive assistant. Whittingham had interest in former Arizona coach Rich Rodriguez, Yahoo Sports reported, before Rodriguez took a job at Mississippi. Whittingham is immersing himself in that process and would like to have a coach hired by early next week, but it may take longer. Utah also needs to replace linebackers coach Justin Ena. Whittingham said the new coach may work with the safeties, apparently meaning defensive coordinator Morgan Scalley would take the linebackers. The Utes' draft-eligible juniors must decide by mid-January whether they will stay in school. Moss and defensive linemen Bradlee Anae and Leki Fotu are candidates. Whittingham said it is possible they’ll all stay, but he’s prepared to lose one or two of them.